Leather vs Plastic - What Kind of Mountaineering Boot Do You Prefer? Here's a short interview with Ed Viesturs on the differences between a plastic boot and a leather mountaineering boot. If you ask me, I'm a leather boot guy. I do have a pair of Asolo plastic boots but I only wore them a couple of times. They're comfortable and warm. However, I enjoy the leather boots more for their flexibility and light weight. I got the Asolos as a gift from a German climber back in 2005 when I was doing rope access work - tree surgery to be more specific - in the yard of his private kindergarten business. My personal pros for the plastic boot would be the possibility to wear the inner boot in your sleeping bag (you may need to do this when you sleep in a snow pit) and walking with those inside the chalet (instead of treading with the plastic shell as well). My first leather mountaineering boots were a pair of La Sportiva Makalu (which still hold to this day even though they look tired) and now I'm enjoying the Mammut Meridian GTX. Anyway, I'm curious to try the La Sportiva EVO GTX to compare it to Mammut Meridian. If you have or had both, leave a comment below and let me know which one you think is better. Thanks! Which one do you prefer - leather or plastic? I never had plastic boots so I can only talk about leather. Plastic must be better as a waterproof boot, right? Yes, you can say plastic is waterproof but it's not breathable. I always found moisture inside the shell after a tour in plastics. But the inner boot can be taken out and have it largely open so both pieces can easily dry overnight. Constantin, I'd agree with you on this one. I like the leather style boot better than the double plastic. You forgot synthetic boots with the same design as the leather though (Scarpa Charmoz vs Triolet Pro). Most companies make a synthetic leather version of those leather boots because synthetic doesn't freeze at lower temperatures. I have Scarpa Charmoz boots and absolutely love them. Looks like you had a good time with your Sportivas, they're certainly well worn. 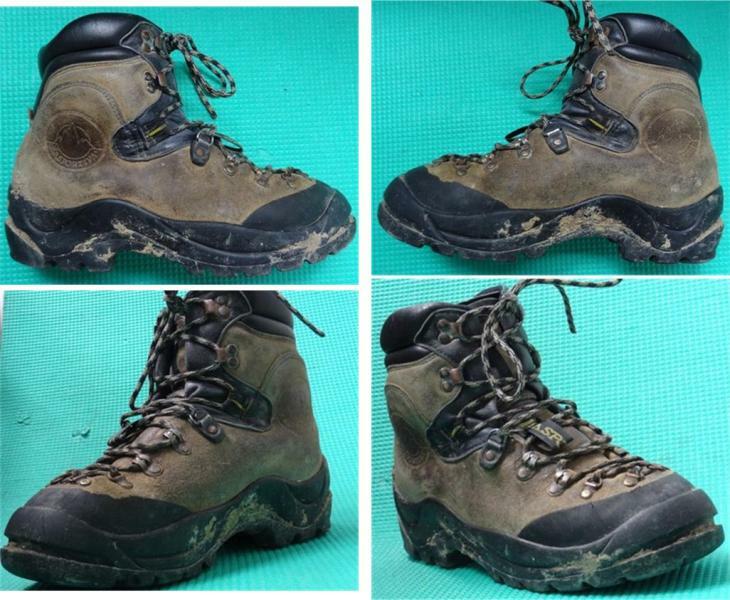 :-) Yep, my Makalu boots had better days. I had no idea about the non-freezing advantage of synthetic boots. That's good to know. Thanks! Tried on a pair of the makalu's last week and found the ankle crease digs in, ended up with a pair of Nepal Evo's. Used koflach verticals on my last trip and found them very good, dry feet and warm at time where everyone was complaining. They are just about dead so I'm keeping them for Aconcagua and using the Nepals in nz. Didn't use plastics much but when I did, my feet were kept dry and warm as well. But don't like them that much coz they're rigid. Awesome part of the world - Tasmania. Thanks for commenting, Mark!